Refreshed by a good lunch and bottled drinks from a vending machine, Andrew and John make their way to Ueno Park from Ameyokocho. Although I’ve been to Ameyokocho in the past, I never found the time to visit nearby Ueno Park which is a very peaceful public space with a lake, zoo, temples and shrines, several museums and plenty of space to walk. 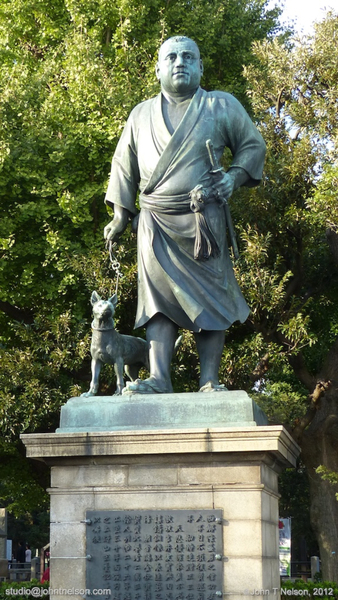 After scaling several flights of stairs, we arrive at the southern entrance to the park where we find the statue of Saigo Takamori, one of the generals in the Battle of Ueno. Then we proceed to walk the central pathway, lined with hundreds of cherry trees, although not in bloom at this time of the year. Ueno Park is very popular as a viewing place for cherry tree blossoms in the Spring and I’m sure they are quite beautiful. Ahead of us stands the Kiyomizu Kannon Temple. Sitting on a hillside, this temple was inspired by the Kiyomizudera in Kyoto, which I toured during my stay in Kyoto. We walk passed the temple and down the hill for a spectacular view of the Bentendo, an octagonal temple hall built on an island in Shinobazu Lake, and the multiple red tori gates of the exit from the temple. Further down this path we find the Ueno Zoo, home of the giant panda bears and children’s amusement park, home of Doraemon and Thomas the Tank Engine. Then we find several displays that are apparently a part of the Tokyo Green 2012 Project. A straw man? Two large mirrors reflecting the plants at their bases? Rice cultivation? Vegetable and flower plantings? These installations lead us to a courtyard with a highly choreographed fountain show. Andrew thinks the fog is actually a deliberate way of misting the flowers. Its all very entertaining although I found the natural beauty of tonight’s sunset more compelling. Finally at the North end of Ueno Park we have the Tokyo National Museum, housing the largest collection of national treasures and cultural artifacts in the country. In addition there is a science museum, a modern art museum and other museums which beck us to return and learn more about arts in Japan. Time to rest my weary dogs with a visit to, yet another large and very beautiful, Starbucks. I believe I’ll have a Venti Mocha and cinnamon roll. This is also the first cup of caffeinated coffee I’ve had in almost a year. Andrew and I experiment with night time photography of the moon and trees as the air grows somewhat chill. 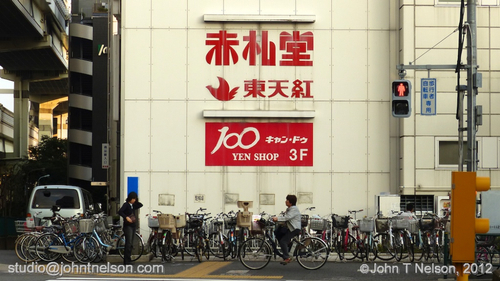 We wander back towards Ameyokocho and the Ueno-Okachimachi subway station where we pick up the Oedo line for a quick trip back to Monzen Nakachou. On the way, I find a Beard Papa’s! There is MUCH more to do in Ueno Park so I anticipate a return trip sometime soon! Today was somewhat more laid back but no less productive or hard on the feet, as Andrew and I searched for different perspectives of Sky Tree. After photographing Sky Tree in Oshiage, we headed across the river to Asakusa, for a different perspective and different lighting. At Matsuya, I went for the large beef bowl set with rice, miso and vegetables, hearty as usual but that was supposed to be a standard Japanese breakfast of fish, rice and miso, not beef bowl. For some reason, Matsuya didn’t list those items on the ticket machine. We recapitulate my earlier solo journey to Sky Tree, taking the Oeda line to Kiyosumi-Shirakawa Station and transferring to the Honzemon line which takes us to Oshiage’s Sky Tree Station. 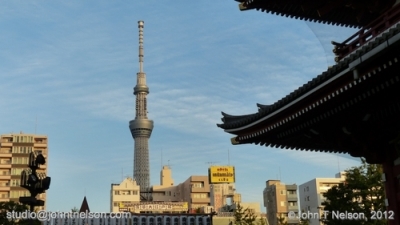 Wow, what a sight Sky Tree is, towering over the Sky Tree Town complex! Sky Tree Town is just as crowded as it was on the weekend and included a lot of school field trips and arranged group tours. First we walk around the perimeter of Sky Tree Town and then head inside and find the Sumida Aquarium, a planetarium, a plastic toy train shop “Plarail” and a Tokyo TV Store where I purchase several Doraemon items. I break for lunch at KFC and a 4 piece meal set that includes large steak fries and a yummy melon drink. The final act of gluttony climaxes with a run to Coldstone Creamery for two huge scoops of chocolate and green tea ice cream, consumed in the shade of the towering Sky Tree. I just hope I can lumber out of here, after all that food! We pop our heads into the Totoro Store, which has tons of Ghibli related wonders for sale. I’ll have to return here sometime soon. 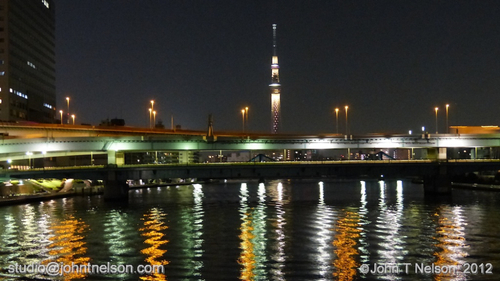 After photographing Sky Tree from Oshiage, we head for the Tobu line and Asakusa for another view of Sky Tree. 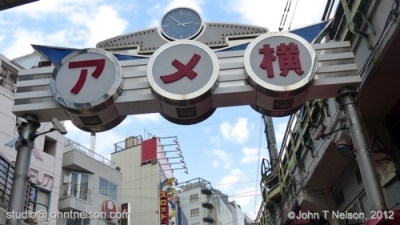 Sensoji Temple and the Nakamise shopping arcade are just down the block from the Tobu line Asakusa Station. 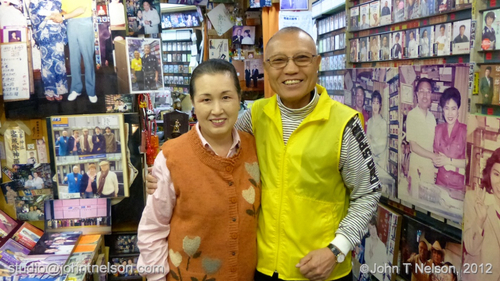 The Nakamise shopping arcade sells tons of souvenirs, although mostly overpriced. The setting sun provides excellent “magic time” lighting across Sensoji Temple… and then the light is gone within seconds as the sun sets beneath the Tokyo skyline and horizon. Taking a break with a cold “Match” vitamin drink from one of the many nearby vending machines. The light changes from twilight to night as the lanterns and spotlights on the temple are turned on, giving new character to the Karamarimon gates, pagoda and temple. The back streets of Asakusa have a great deal of character and we find another terrific view of Sky Tree. As a curiosity, we visit the new Visitor’s Information Center across the street, which is a lovely, modern building both inside and out. Gone is the marionette clock which I video taped five years ago, the figures preserved behind a glass case with no more time keeping duties left to them. Time to hit the road and back to the apartments. This time we will take the Oeda line straight back to Monzen Nakachou from the Oeda line’s Ginza Station not even a half a block away. Finally back at the apartment and settling in with hydration, a snack and laundry! Today’s random throw of the dice says “Kiyosumi Garden” a few blocks north of the apartment. I had visited Kiyosumi Garden on my first trip to Japan in 2007 and found it to be all around lovely, and full of natural and designed wonders, living in harmony with each other. There’s even a monument to Bashou, the preeminent Japanese poet. Andrew, a friend also staying in Japan, has never been to Kiyosumi Garden, so this is a good opportunity for him. Andrew and I decide to first tank up at the Mister Donut, next to the Tokyo Metro Oeda line station. We won’t need the Metro on this trip because Kiyosumi Garden is a moderate walk of several blocks. Here is another thing in Japan that hasn’t changed a bit since I was here five years ago, and the garden is just as beautiful as ever. We circle the lake as a cold front turns the sunny sky into intermittent showers and storm clouds, but this just provides additional photo opportunities. Andrew consciensciously brought special DSLR rain bags to shroud our cameras during storms, and we need them too! I just wish I had brought an umbrella, but those are easily obtained at every local conbini and kusuriya. We’re both hungry from all of this walking, so we stop at a Manjayaki restaurant for lunch, ordering two servings of Manjayaki, one with mostly vegetables and the other with pork, shrimp, squid and octopus. We watch as the waiter prepares the first serving, and then Andrew and I take turns preparing the second. Its pretty straightforward: you first squirt some vegetable oil on a hot plate and then pour the vegetables and meat onto the hot plate to cook. Then you pour a batter/sauce onto the “fixin’s” being careful to mix everything together into an even consistency with a pair of large spatulas. Let the Manjayaki cook until its nice and gooey and caramelized, I prefer to let the bottom cook until its nice a brown and most of the liquid has boiled away. The Manjayaki is then eaten directly from the grill with small personal spatulas. Its a fun and very social food. After lunch, we continue towards the park until we arrive back at the Tuskushima subway station, but the weather looks threatening so we continue on to our next adventure: paying a visit to Odaiba! This time we take the Oeda line to Shiadome where we pick up the “Yurikamome” driverless, automated, elevated train which takes us passed many familiar Odaiba landmarks including a spectacular view of the Rainbow Bridge. While in Shiodome we find a fantastic vantage point to photograph the Shinkansen and an amazing clock built by sculptor Shachimaru Kunio who also built the giant Laputa robot on the rooftop of the Ghibli museum. 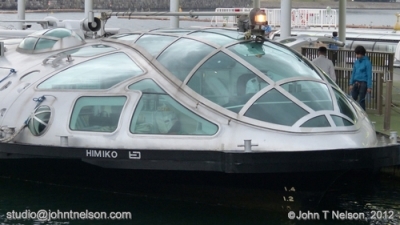 The Shinadome clock was obviously inspired by Myazaki. There’s much more to Shiodome too so we shall return at a later date. And The Statue of Liberty. Yes, The Statue of Liberty, or rather a replica of one of the original models in France. At any rate, its pretty cool. There is one subtle but obvious difference between the statue in New York Harbor and the replica in Japan… the full size version in New York faces the sea to welcome immigrants, the replica in Japan faces towards the city. It begins to rain again and we seek shelter about ten feet from Liberty, under an elevated platform. Fortunate for us and our expensive cameras. The rain is becoming more intense so we seek shelter in Aqua City and the warmth of hot coffee and pastries at Starbucks. This is one of the nicest Starbucks I’ve ever been in too. Its odd too because I’m sitting in a Starbucks, listening to R&B hits from the 70’s and sipping a typically American drink while enjoying a WARM cinnamon bun…. in Japan. The Japanese do enjoy their creature comforts and I harbor no ill-will towards them for that. The ability to enjoy an afternoon (or a rainy evening) over a hot drink, good food and a good book is a very civilized pastime. It turns out that this Starbucks is also a great vantage point for photographing Liberty, Tokyo Tower and the Rainbow Bridge. The sun has set, giving us some perfect night time views for photography. Time to head back to the Yurikamome line. The wind is becoming ferocious and I wonder if another cold front is coming, along with more rain storms. Before returning to the apartment, I stop off at one of the local kusuriya to pick up toilet paper, paper towels, laundry detergent, body soap, mouth wash, calcium, vitamins and snacks. Vitamins are expensive in Japan. And true to form, it begins to rain heavily on the walk back to the apartment. Well it could be worse, could be raining… oh wait. I may have to buy an inexpensive conbini umbrella if this persists. Finally, relaxing after a full day of exploration, photography and videography. Today is my second birthday! Since I celebrated my first birthday a day early in Japan, now I get to celebrate my birthday in my home country’s time zone! Birthday celebrations will have to wait, though. First I have to pick up the keys to my Tokyo apartment, where I’ll be staying for the next 30 days. The rental company, Sakura House, is located in Shinjuku so I start my apartment rental adventure with a subway ride from Monzen Nakachou to Shinjuku! Note of interest: The Odakyu line station is also located in Shinjuku. Odakyu owns and operates the train line, hotels and other facilities in the Hakone region, a resort area that my friend Andrew and I are planning to visit. Picked up several brochures, these could come in handy when making travel plans. Arriving at the offices of Sakura House, I fill out the necessary paper work, pay for a full month’s rent in advance and pick up the keys. Sakura House has a mailing list, blog site and Facebook page which will keep me in the loop with such activities as DesignFest 2012, held at Tokyo Big Sight in Daiba, this November. A quick subway ride back to Monzen Nakachou and I’m settling into my Sakura House apartment for the second time. I find living in a long-term stay apartment like this to be more convenient, cost effective and roomier than a hotel room. After unpacking and settling in, I relax and find this particular apartment to be cosy, tidy, clean and with enough room for my computer, photo gear and clothes. I have my second birthday dinner at Matsuya, a chain of gyudon/noodle restaurants, similar to Yoshinora where I had dinner on my first birthday. No cake on my birthday? Instead, I’m enjoying a cream filled chocolate pastry while watching Japanese baseball in HiDef, courtesy of Tokyo Sky Tree! Tonight’s game between the Yomiuri Giants and the Chunichi Dragons determines the Central League winner and who will play the Pacific League for the Japanese World Series! The Giants win! Andrew comes up with an interesting idea, let’s walk across the Eitaibashi Bridge and take photos of Tokyo Sky Tree at night over the Sumidagawa. Well, not only did we photograph Sky Tree, but we also photographed the Eitaibashi Bridge itself and Tsukushima which is also clearly visible on the horizon. This impromptu photo shoot was also a great opportunity to test video modes and compare camera settings and underscores just how easy it is to walk to Tokyo proper. All that waterfront photography and walking makes me hungry so I have some late night beef bowl and miso at Matsuya!